The Japanese director Kiyoshi Kurosawa has been directing films for both the big screen and television since the mid-1970s. Kurosawa is not exactly genre-specific but he's probably best known for his Japanese horror films, like The Cure and Pulse (which Wes Craven later wrote an English adaptation for in 2006). However, I find Kurosawa a more interesting filmmaker when he steps out of his popular horror genre, like he did with his 2008 masterpiece Tokyo Sonata. That film was a straightforward drama on the surface, observing a family in disarray after the patriarch loses his job but doesn't have the stomach to share that information with his wife; it curdled with an implosive sadness and palpable urgency beneath the surface. Kurosawa depicted the everyday struggle as a sort of a horror spectacle, but with dialed down theatrics in order to let us feel his characters angst and uncertainty. It's really a remarkable film. Now Kurosawa returns to a more visually spectacular enterprise with Before We Vanish, a modern version of Invasion of the Body Snatchers -- but much, much more leisurely droll. Before We Vanish starts off promising, with an opening shot ominously showing goldfish in water. It's only moments later when we are startled to see the grisly murder scene of two parents on the floor, with their teen daughter giving blank looks at her parents' corpses and her own bloody hands. This teen daughter appears to be the first person to have been inhabited by an alien (who by the way we actually never see in their natural form). As the story progresses we learn these aliens have been inhabiting the bodies of other locals, and in particular our protagonist Shinji (Ryuhei Matsuda). 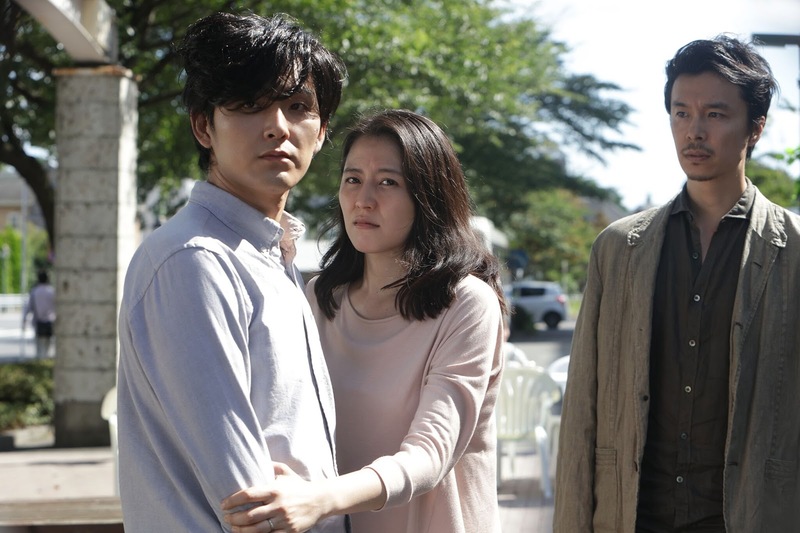 Shinji's wife Narumi (Masami Nagasawa) at first is convinced it's a medical problem. She takes him in for an evaluation. It's results in little help because she's stuck with taking Shinji home to essentially see if his weird behavior dissipates. Then the story circles back to our teen daughter, who has joined forces with another alien-inhabited person and a journalist who is curious about these strange people rambling about a coming invasion. We suspect that both parties will eventually meet in the third act, obviously. If this all seems kind of uneventful, it's because the film treats its big premise with a very "blah" kind of attitude. The Japanese citizens seem to just shrug everything off. There are hysterical believers on street corners spouting that the end is near, yes, but most people seem to just go about their day. Maybe this is Kurosawa's point: in today's world, people are just too honed in on their lives (or misery, for that matter) to care if big spaceships are indeed going to invade and wipe everyone out. Yet, I think the film's biggest problem is that it doesn't know what kind of subversive black comedy or social satire it's trying to be, and as a result, it ends up being really unimpressive and lazy. There are unexpected moments of violence and action but they seem strangely out of place, even for a Kurosawa film. Near the end, the tension picks up as government forces close in on our alien-inhabited persons but the shootouts and showdowns brim with little urgency or excitement. I found the closing ten minutes to be especially corny, as Kurosawa and his co-writer Sachiko Tanaka try to quickly reshape the film as message movie. Before We Vanish was based on a stage play by Tomohiro Maekawa and maybe that's where it should've stayed because its realization to the big screen was literally and thematically lost in translation.